The house east of 'The Royal Oak' is one of the most picturesque in the village, especially when the front and garden doors are open and you get a view towards the sea of a very attractive gardens. 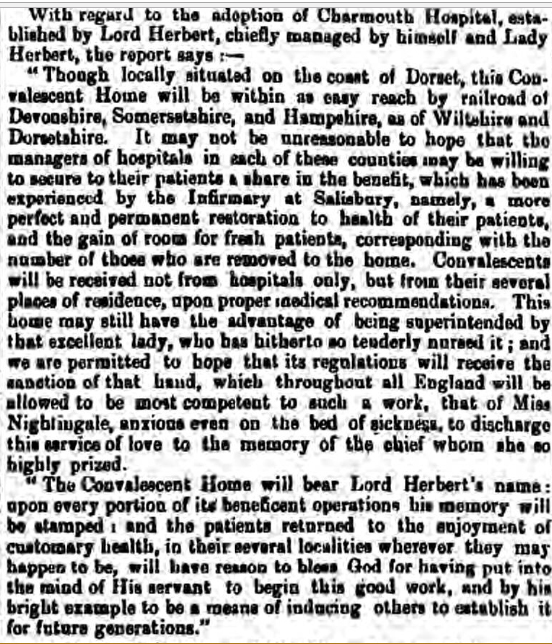 In 1857 it was owned by Lord Herbert who opened a convalescent home which had 20 beds and a resident matron. Cecil Woodham-Smith in her "Life of Florence Nightingale" says that Florence nightingale went to the opening ceremony. This is not the only mention of Florence Nightingale in connection with the village. When she was matron of St.Thomas Hospital, the first trained District Nurse she appointed in 1877 was Miss Girling, who later married the Rev.W.W.Nicholls Rector of Charmouth. 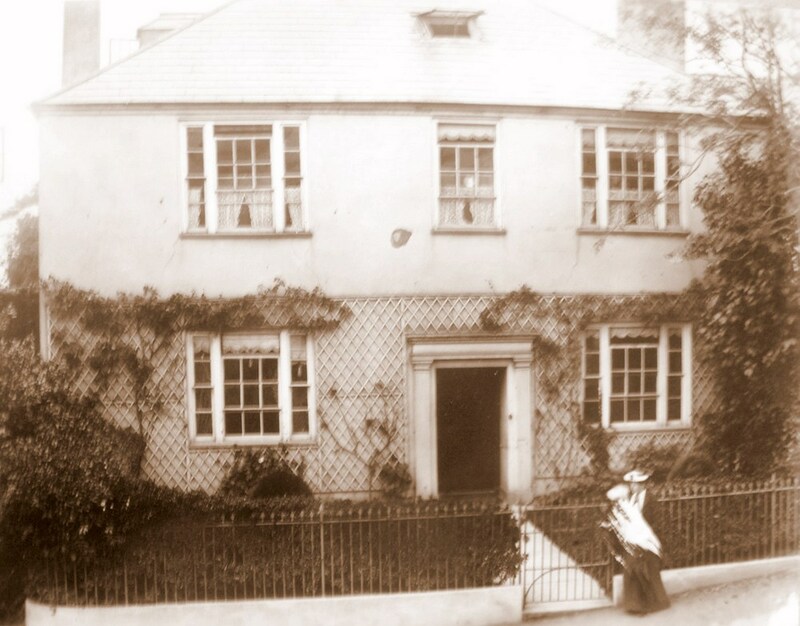 The house during the 1860s was owned by Samuel Lowndes, whose wife died in March 1870, and was buried in the church yard behind the yew arch. 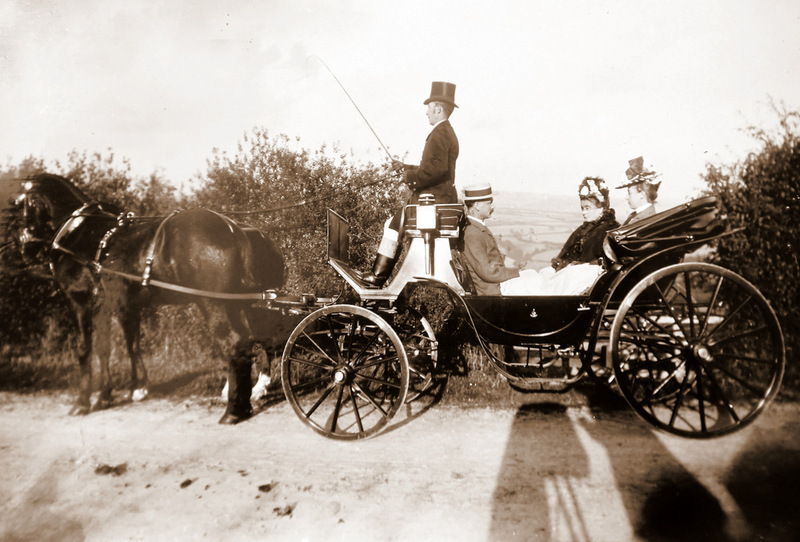 In 1860 the house was occupied by Mrs.Palmer and her daughter, and a few years later J.W.Harrison of "The Hurst" Regents Park was introduced to Charmouth by Dr.Hugh Morris, brother of Dr.Henry Edmund Norris and. purchased it, calling it "Little Hurst"
J.W.Harrison was born in 1830 and wac apprenticed to his father as a printer at Stationers' Hall London 1844. 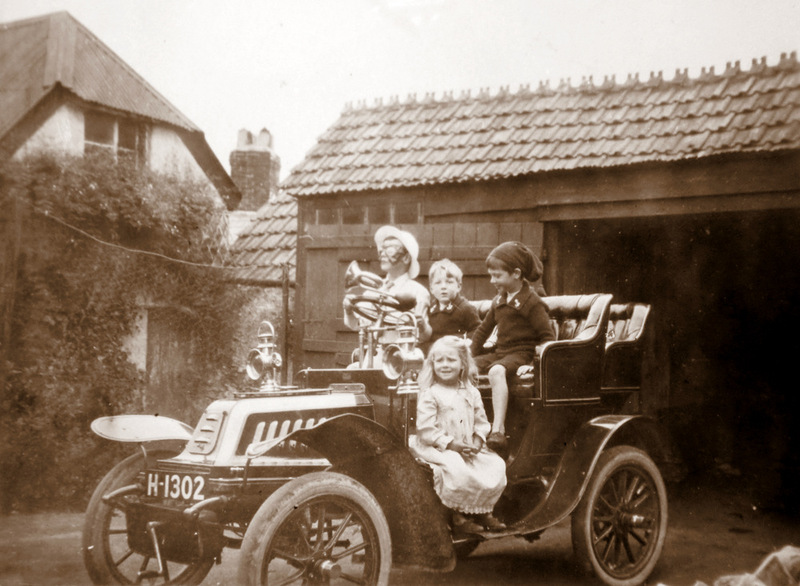 He later became senior partner of Harrison and Sons, Printers in Ordinary to Her Majesty. He was the first to adopt the typographic method of printing music, and was confidential printer to the Foreign Office and the London Gazette. (The Times May 1912) He was a most successful amateur photographer and Charmouth owes him a great deal for the many views which I have been able to reproduce in my albums. He died in May 1912. 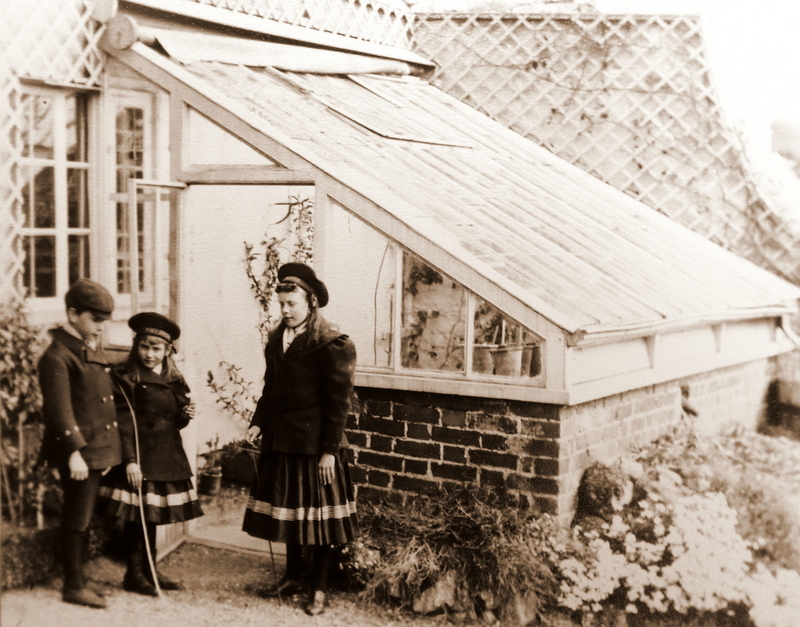 "Little Hurst" then became the property of his only daughter Mrs. Mann and. in 1957 it passed to his grand sons J. and P. Mann. Close to the western wall near The Street is the grave of Jane, mother of Charles Fowler, the famous Architect, who designed the present church. There is another memorial inside the church to the same lady high above the Vergers room. The former describes her as the widow of John Fowler a Merchant living in Collompton and sister of Mary Culverwell. Her husband John had been a wealthy Clothier based in the town who had died in 1814. 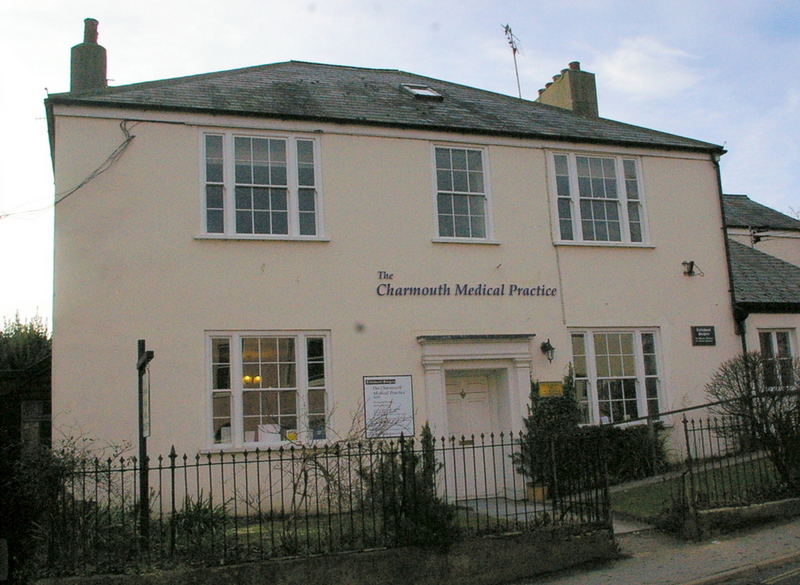 She moved to Charmouth and lived with her sister Mary Culverwell at Little Hurst, which is now the Doctors Surgery.This was owned by her nephew Samuel Coade Culverwell who had inherited substantial property in the village from his father Robert, who had died in 1811. 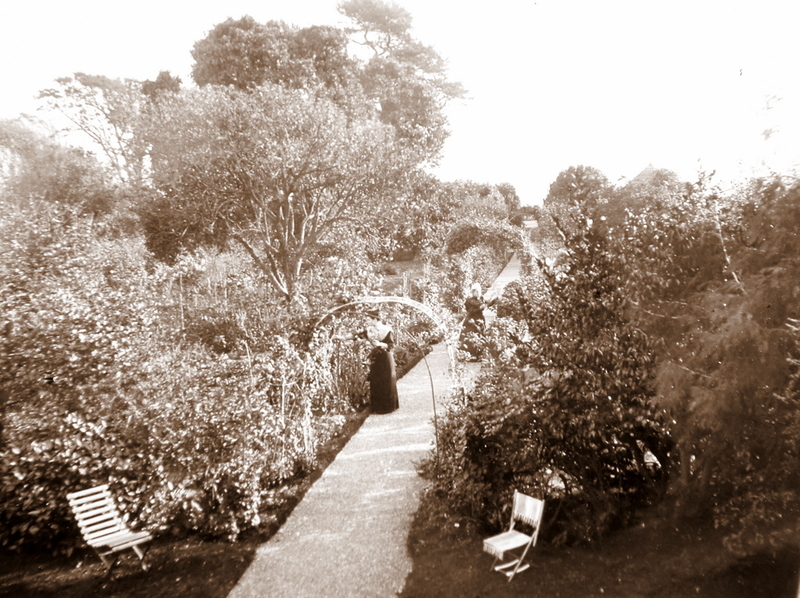 He also had inherited Newlands from an Aunt, Margaret Coade. 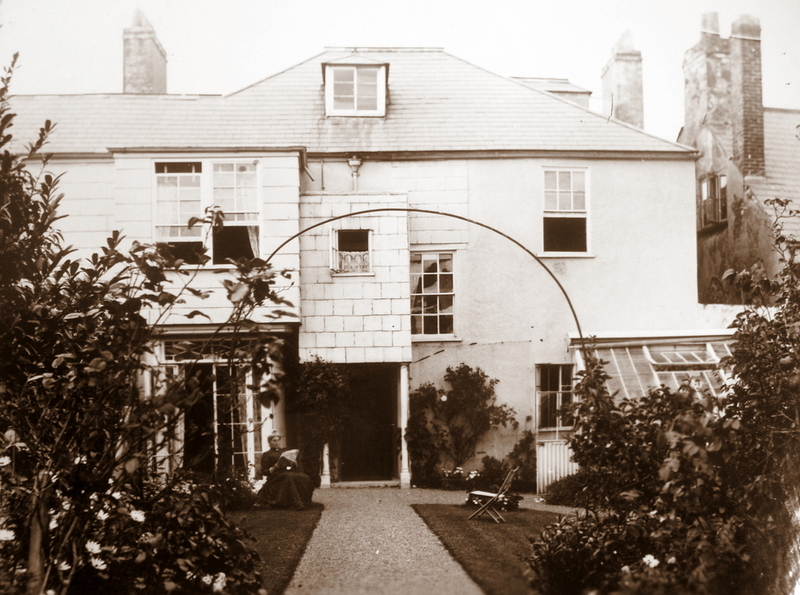 It was her brother, Samuel Coade who had purchased Newlands originally and had left his former house, Belmont in Lyme Regis to his niece, Eleonore, famous for the Coade Stone she manufactured at Lambeth. Jane Fowlers son Charles must have known Eleonore as he purchased a number of her statues for Powderham Castle in Devon for the Courtenay family. The family tree below shows how they were also related to the Shute and Tozer family who also lived in Charmouth. The 1798 Land tax records show Newlands under Catherston Manor with Francis Dennere renting it from Samuel Coade. He also owns "Thomas's Common" in Charmouth where he is paying 8s. land tax. The document also shows Ann and Eleanor Coade owning property in the village. Samuel was very rich, owning a number of properties in the area around Lyme Regis. When he died in 1808 aged 84 he left his wealth to his nieces Eleanor and Mary Tozer, who was the daughter of his sister Margaret who had married in 1745, Aaron Tozer at Exeter. It is Mary Tozer who is to inherit Newlands from her Uncle and is shown in 1830 Pigots Directory under the heading of Gentry for the village.